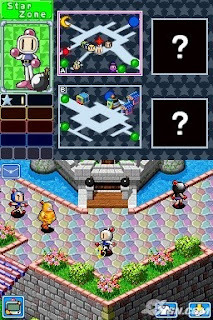 Bomberman Land Touch 2 NDS apk android for DraStic free download working on mobile and pc,Nintendo DS EmulatorBomberman Land brings together three exciting game modes into one. The series introduces a bevy of mini-games, where most can be played in multiplayer mode. The Nintendo DS system version features 40 mini-games to play through. 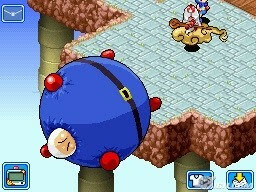 In addition, the Bomberman Land series features a robust single-player Story Mode, where players can explore a fantasy land and solve quests and puzzles with the ultimate goal of restoring peace and tranquility to the beleaguered Bomberman world. Best of all, the game includes the Battle Pack Mode, the classic multiplayer Bomberman experience that gamers know and love. The DS version also allows gamers to share one game cartridge and network with friends to create the ultimate party game.40 Mini-games –Sports fan? Try your stylus at the Soccer Striker mini-game…Or are you the outdoors type? Jump in the river and try the Up the Creek mini-game. With 40 unique, addictive mini-games there’s something here for everyone. Multiplayer Action – Play up to 8 players via Nintendo Wireless Connection or go head-to- head against 4 of your friends via Nintendo WiFi Connection. Single card and Multi-card play is supported. 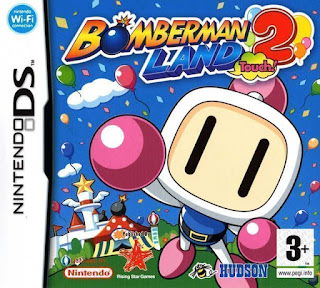 Fun-filled Adventure – Uncover the devilish plot of the Evil Bomberman and uncover 2 alternate endings to the game. Full Stylus Control – Specifically designed for the Nintendo DS, Bomberman Land Touch! 2 features full Touch Screen control. Original Bomberman Battle Game Included! 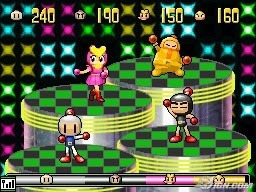 – The Original Bomberman Battle game is included with all new maps and power up items. Multiplayer Strategy Action doesn’t get better than this!